In the green heart of the city of Hildesheim, the Dorint Novotel Hildesheim is a top choice because of its calm location close to the historic old town and its comfortable facilities. The Dorint Novotel Hildesheim offers 120 rooms, 3 suites, and 7 meeting rooms with a maximum area of 700 m2. The rooms are elegantly furnished and all feature air conditioning, direct dial telephone, hairdryer, satellite TV, mini-bar, work desk with lamp, and modem adapter. The restaurant "La Capella" offers a mouth-watering variety of culinary delights and the Kennedy's American Bar, decorated in classic American style, serves drinks and cocktails until 1 am. Although the hotel doesn't have any sport or fitness facilities, the surrounding area provides many possibilities. These include tennis courts, squash, rafting, fishing, mountain biking, horse riding, bowling alley, and much more. Information on the attractions and cultural events in the surrounding area are given at the front desk. There are seven meeting rooms with a maximum capacity of up to 700 people, and the latest equipment to handle meetings and conferences. Technical assistance is provided for the organization of these events. The hotel also offers a car park, child care services, airport transfer, laundry valet, shoeshine machine, currency exchange services, and safe deposit box at the front desk. 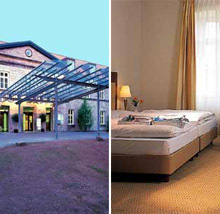 The Dorint Novotel Hildesheim is located near the historic old town of Hildesheim, 25 km away from Hannover.